From choosing the fabric and batting to finishing that last stitch, completing a quilt is a noble occasion. However, when it comes to finishing, many people take their quilts to a professional longarm quilter. What you may not realize is that with the Baby Lock Royal Longarm Family, longarm quilting is definitely within your reach. As the first home sewing company to bring you longarm quilting, Baby Lock hopes to make you feel like a quilting queen with the Crown Jewel. Its 18-inch throat space is the most popular size in longarm quilting, making the Crown Jewel the head of the Baby Lock Royal Longarm Family. For beginner longarm quilters or those who prefer a sit-down machine, the 16-inch Baby Lock Tiara is ideal. 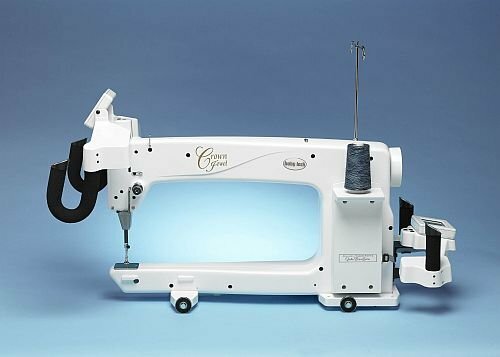 Both longarm quilting machines come with many user-friendly features. Some of these features are powered by Baby Lock IQ Technology™ which works with the machine’s “brain” to make longarm quilting easier for you! Read on to learn which member of the Baby Lock Royal Longarm Family is right for you.